Lilac (Syringa spp.) is a flowering shrub noted for its fragrant purple flowers in early spring. Butterflies flock to the blossoms, as do gardeners, seeking a bouquet to perfume the house. Lilacs range from tiny dwarves four feet tall to small trees over 20 feet tall. Most varieties, however, are in the eight to 12 foot range and have an upright growth habit. The spade-shaped foliage is not particularly striking, but the heavy flower clusters definitely are - they are comprised of hundreds of tiny star-shaped blossoms that emit a heavenly fragrance. As the name suggests, light purple is the most common color, though there are white, pink, magenta, yellow, and bluish forms available. 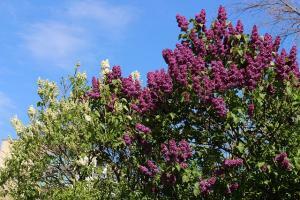 Lilacs grows best in cold climates and are unlikely to produce flowers in places with mild winters. They need at least six hours of sun each day, regular moisture and rich soil to flourish. That being said, mature specimens are quite tough and will often thrive for decades with minimal care. Lilacs make a stunning specimen to use as a focal point amid a bed of smaller perennials and are also a serviceable shrub for using in a hedgerow. They are particularly striking when under-planted with spring-flowering bulbs. 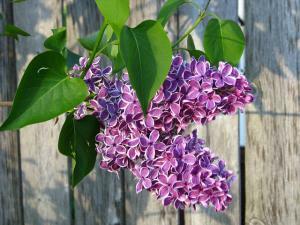 Lilac is best planted in fall or early spring when the weather is cool and moist. They prefer soil that is rich in organic matter, so it pays to amend the soil heavily with compost at planting time. Plant them 10 to 15 feet apart as specimens or six feet apart as a hedge. Water young lilacs on a weekly basis when there has not been a soaking rain and keep them mulched through the summer months to conserve moisture. Fertilize lightly, if at all, and use a product that is relatively high in phosphorus. High nitrogen fertilizer stimulates vegetative growth at the expense of flowering and can predispose the plants to pests and disease. Lilacs can be sheared as a formal hedge though this will severely reduce flowering. In general, lilacs should be lightly thinned and pruned for shaping and to remove any dead or diseased wood once per year immediately after they flower. Pruning later in the year effectively removes the wood that will form next year's flower buds, thereby reducing the bloom. 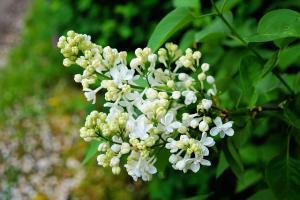 There is a handful of pests and disease that attack lilacs. Powdery mildew is one of the most common, but is more of a cosmetic issue and rarely causes significant harm. It appears as a dusty white substance on the leaves and can be controlled with fungicides if necessary. Scale are tiny white sucking insects that can appear on the leaves and twigs. Try knocking them off with a blast from the hose or pruning out the most heavily infested branches. Spraying the plants with horticultural oil is effective for severe infestations. Lilac borers are tiny beetles that burrow into the wood, weakening the stems and are evident from the nail-sized holes they make in the wood. Pruning out infected wood is important though they can also be treated with insecticides. There are many improved cultivars and hybrids to choose from, which are widely available at nurseries in the regions where lilacs grow best. 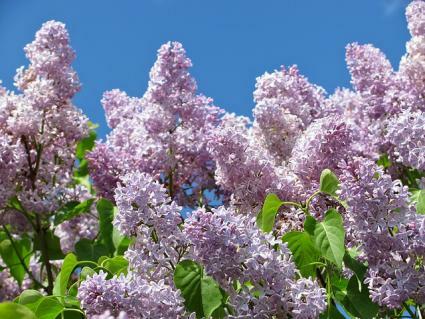 'Lilac Sunday' grows eight to 10 feet tall and sports flower clusters up to two feet long in the classic purple color. It's hardy in USDA zones 3 to 7. 'Sensation' lilac grows up to 15 feet and has white margins encircling each of the purple flowers. Plant it in USDA zones 4 to 7. 'Josee' grows just five feet tall and has sprays of bubble gum pink blossoms. It's suitable for USDA zones 2 to 9. 'Signature' is a tree form growing up to 25 feet with white flowers. It's hardy in USDA zones 3 to 7. Lilacs make bees, butterflies, and people swoon with their intoxicating fragrance that heralds the first days of spring. In the right climate and planted in the right spot, they are easy to grow and long-lived.